The Thaland National Museum in Phuket, Thailand responds to allegations that beads excavated in 2005 are missing – they were taken off the display stands for research. Archaeologists are lamenting the destruction of a 105-year-old wall in Phuket’s old town. The wall was cleared to make way for a development project and the developer said that the land was acquired legally. 16 November 2007 (Phuket Gazette) – Did you know you need a permit before taking Buddha images out of Thailand? I didn’t either. Shoppers looking for souvenirs in Thailand should take note then. While most of the images are cheap imitations, apparently some archaeological material may slip through, like how a Khmer sandstone head was seized from a departing tourist last year. 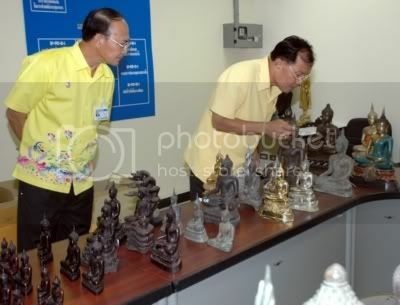 In a small ceremony at Phuket International Airport, Airport Customs officials yesterday handed over to the Thalang National Museum 93 Buddha images seized from departing tourists over the past year. Phuket Airport Customs Director Ruthai Lertkietdamrong told the Gazette most of the images were seized from tourists who bought them from shops unaware that they needed permission from the Fine Arts Department to take them out of the country. 21 June 2006 (Phuket Gazette) – British Government stops plan to salvage WWII submersibles off Phuket. The British government has scotched, at least for the time being, a planned attempt by local salvage company East Marine SBS Co to raise two British World War II Chariots from the waters off Phuket. The Governor said after the meeting, â€œI told East Marine SBS that if they received approval from the British Admiralty, I would allow the salvage project. But today I received a letter [from the British government] stating that it regards them as assets of Britain and pointing out that it is British military tradition to leave in place any vessels lost during war. 6 May 2006 (The Nation) – Possible WWII British manned torpedoes to be investigated in Phuket. A Phuket marine-supply company is seeking permission to salvage what it believes are two British “human torpedoes” that have been lying in the sea near Phuket since World War II, the governor of Phuket said yesterday. Manned torpedoes were secret naval weapons commissioned during World War II. The British versions were electrically propelled mini-submarines with two crewmen equipped with diving suits riding astride.